Documents the filmmaker's journey toward discovering the truth about an Israeli Army mission he participated in during the first Lebanon War of the early 1980s that left him with a loss of memory about the events. The long-forgotten images begin to resurface as the director interviews old friends and comrades around the world. Unlike any documentary you'll ever see, not least of all because of the animation style. Not too many docs lend themselves to animation too easily, and when I started watching this, the first thing that came to mind was 'Waking LIfe', but this is not to be confused with that film's rotoscope animation, which generally has a shakiness of the drawn images over the actual shot footage. Here's what Wikipedia says: "The animation, with its dark hues representing the overall feel of the film, uses a unique style invented by Yoni Goodman at the Bridgit Folman Film Gang studio in Israel. The technique is often confused with rotoscoping, an animation style that uses drawings over live footage, but is actually a combination of Adobe Flash cutouts and classic animation." Putting aside the animation aspect for now, the doc itself is a continuos unwinding mystery of one man's blocked memories of fighting in the Israeli militia during the invasion of Lebanon in the early 80's. He interviews his old army buddies and some others connected with the war, and each reveal their own experiences, prompting Folman to remember bit by bit his own association with the war. This was all a very new history lesson for me, and ultimately quite disturbing as it leads to the inevitable genocide. The final moments of the film are particularly startling, as the animation shifts into real footage of the results of the massacres. And while the dialogue is straight-up interveiws and storytelling, the animation ties it all together in ways far more astounding and poignant than a regular doc ever could. The mastery and freedom of the medium allows for dream sequences come to life, surreal situations fully realized, and sombre moments given their due through tasteful tones and beautiful settings. 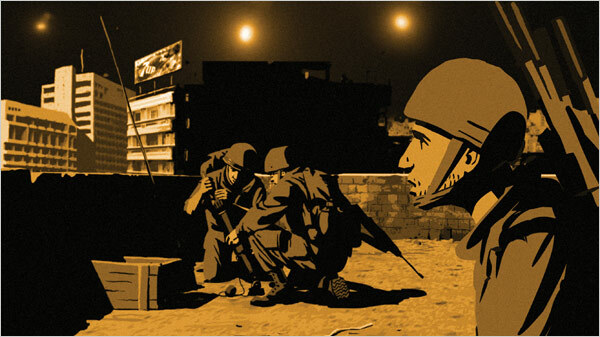 Stand-out scenes like a soldier recalling how he escaped certain death by swimming through a calm sea at night after his troops abandoned him, and a quiet moment when the director is walking through the Beirut airport, not fully comprehending the extent of the damage outside, are all the more powerful because of the uniqueness and fluidity of the animation style. Jeffy, you will love this film, but I encourage everyone to check it out. I absolutely concur with Mitch's review. This came in over the holidays via Zip. What an innovative, masterful film. I am always complaining when I see a movie I have seen a dozen versions of before (e.g., I lurved the opening hour of Drive because it had an original - albeit in obvious hommage to earlier work - opening; but then lost a star when the final 45 mins felt like every other gangster/heist/mob movie that has been made before...). 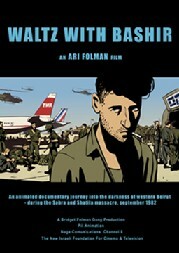 Well, Waltz with Bashir is a tower of achievement. An achievement in structure and style. Brilliant. I'm not sure how to rate this - while I agree with all the above, the movie was disturbing to an extreme level. But do I punish it for this? I was mortified by the final scenes (to the point of tears) just as I was with Schindler's List. It's like a weird dichotemy, I could happily live my life without seeing the evidence of these attrocities first hand but don't want to live with the ignorance that things like this are possible. In any event, I'm both sad and glad I saw it. I feel more educated (as I really don't know much of what went on in that time/place) but at the same time am now EXTREMELY depressed and sick.